Andy Reid’s teams throw a low rate of interceptions. 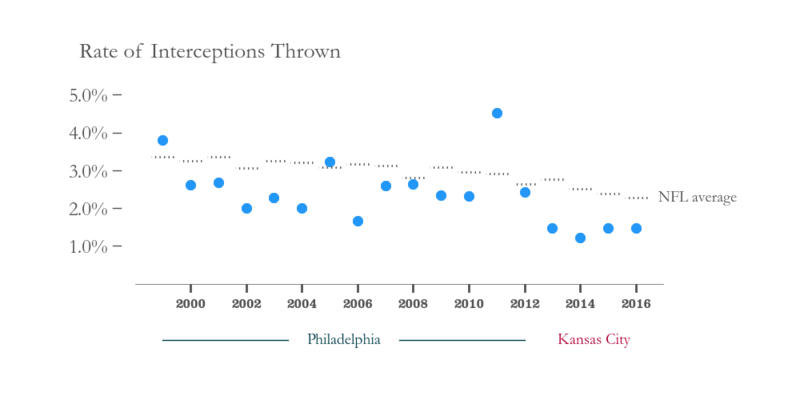 The visual shows how his teams in Philadelphia and Kansas City have had a lower than NFL average interception rate (interceptions divided by attempts) in all but 3 of 18 seasons. Reid’s Eagles had a particularly good stretch of pick suppression from 2000 through 2004. Led by quarterback Donovan McNabb, Philadelphia never won fewer than 11 games in any of those 5 seasons. Despite a decreasing interception rate across the NFL, Reid has continued to beat the NFL average over the past four years in Kansas City. Led by quarterback Alex Smith, the Chiefs have won 43 regular season games and never dipped below 9 wins in any one season. The visual goes against the typical quant narrative that turnovers are random. For example, I’ve shown this visual that shows the relation between interception rate the first 6 games of the college football season versus the remainder of the season. The lack of correlation between these quantities shows that you can’t predict a team’s interception rate later in the season based on the same quantity during first 6 games. This suggests interceptions are random, and a team has a 50% chance to have a better or worse than average interception rate. However, if you assume this for Andy Reid’s teams, there’s only a 0.37% chance his teams would have had 3 or fewer seasons with a below average interception rate. 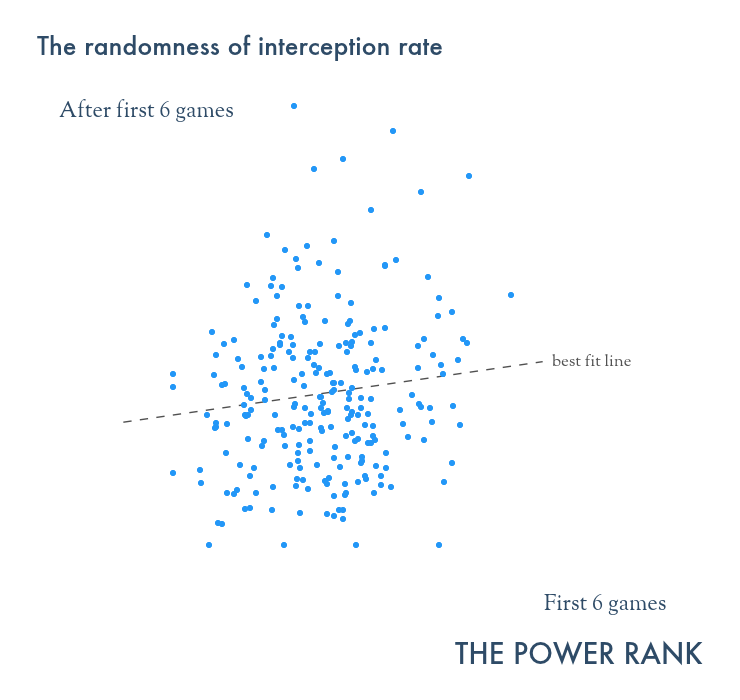 Randomness certainly plays a role in interceptions. No one who has ever seen a tipped pass fall into the hands of a defender should doubt that. However, the Reid visual suggests that some coaches can suppress interceptions over a very large sample of games. This has implications in predicting the outcome of the Steelers at the Chiefs playoff game this weekend. My research shows the importance of passing over rushing in the NFL. Turnovers have little impact on yards per pass attempt. However, if Kansas City is truly skilled at not throwing interceptions, then these pass efficiency numbers will underestimate their team strength. Team rankings based on adjusted margin of victory might be a better way to evaluate Kansas City. Their low interception rate will impact margin of victory, as I’ve found that an interception is worth 5 points in the NFL. My member numbers combine both pass efficiency and margin of victory to make Kansas City a 1.3 point favorite against Pittsburgh. However, my team rankings based on only points would make Kansas City a 3 point favorite. I interviewed Ben Alamar on the Football Analytics Show this week, and his FPI (Football Power Index) makes the Chiefs nearly a 5 point favorite. They use an expected points added, a metric which accounts for interceptions but their own twist. To listen to that part of the discussion, go to 14:50 of my interview with Ben Alamar. Assuming running yards are constant and close to equal (I don’t care about passing yards) what is the correlation between wining/losing and throwing more INTs. My guess is the team throwing fewer, in any game, wins at about 85% of the time. Just a guess. Take rushing yards out of the equation, make them irrelevant, and my guess is that rate falls to about 75-80 percent. Still profound. Make INTs equal and my guess is that the team that rushes for more yards wins at about 75%. So, here’s the conundrum. There is no doubt that a—passing is more important than rushing in the NFL b—INTs are the most important individual stat c—net YPPA (O minus D) is the best individual stat for evaluating the quality of an NFL team but d—rushing yards mean more than passing yards; not all yards are created equal. When you solve this equation, Dr. Feng, I will be eternally grateful. So, here’s the conundrum. There is no doubt that a—passing is more important than rushing in the NFL in a macro sense, b—INTs are the most important stat in any individual game c—net YPPA (O minus D) is the best “bog picture” stat for evaluating the quality of an NFL team but d—rushing yards mean more than passing yards; not all yards are created equal. That is, the correlation between passing yards and winning is likely around 50/50, holding INTs neutral. However, if INTs are neutral the running winner is plugging away at 75% or so. Thanks, Craig. Let’s dig into it this off season. But first, let’s note that teams run when they’re up, and hence rush yards “mean more” than pass yards. They’re might be no correlation between pass yards and winning holding picks equal, but that’s because teams that are down pass more. Look at total pass yards in the first half, and you’ll get a new story. So we really need to dig into play by play. … and how many teams since 2000 has Andy Reid coached in the superbowl? won the superbowl? oh thats right, he is a HORRIBLE in game manager and even over all those years never managed how to use the Game Clock to his advantage…..
Ed feng has been wrong about the spread towards the end of the season for both college and pro football so its very hard to trust his opinion now. There’s no more important concept for those who would make this comment. I have long been skeptical of the randomness of turnovers – there are too many unobserved variables (and hence, bias in the model) to be certain that turnovers are truly random, IMHO. Further, randomness is a sliding scale, or a continuous variable, which means there are different degrees to which a statistic (like turnovers) is random, isn’t there? All that said, I have felt like controlling for the player and coach effects (i.e. the fixed effects of players and the fixed effects of coaches, to use econometrics jargon) would reduce the randomness in turnovers. Certain players are said to be “prone to fumbling” or “prone to interceptions”, which completely runs against the idea that these events are random. To be really specific: If you simply added binary variables for all the coaches in college football to the model above (where TO’s in first 6 games predict TO’s in last 6 games), I really wonder what would happen to your R-squared. I have always been curious about this, for years, and am finally saying something about it because I hope you have the data, skills and software to test this. And just a final question: Isn’t that scatterplot indicative of a positive correlation, but the coefficient is not statistically significant? The line is positively sloped, but perhaps it’s slope has such a large standard deviation that you cannot say with certainty that the relationship between those two variables is NOT zero. Am I interpreting that correctly? If so, would it be possible to also publish the 95% confidence interval? How far below zero does the CI go for that model? I guess I’m just wondering if you could say, from your model at this point, that teams that turn it over a lot in the first 6 games are more likely to turn it over a lot in the last 6 games. But to say that means you need a positive slope for that line. Thanks Dr. Feng! Been a long time reader and even remember you answering my email questions one time (thanks)!! Thanks for reading and commenting Austin. Yes, there’s a small correlation in the figure. It’s not statistically significant, but that’s an average over all teams. The Reid analysis shows that there are outliers that consistently suppress interceptions. I have followed football since I was 12 (69now). The other major factor whoever throws the ball more often losses almost at same percentage! You probably don’t have to guess what team throws more interceptions!